The Age Standardization feature can be selected by checking the check box. The default selection of the Age Variable is Age Standard Survival (15-44, 45-54, 55-64, 65-74, 75+) is based on the age recode variable. 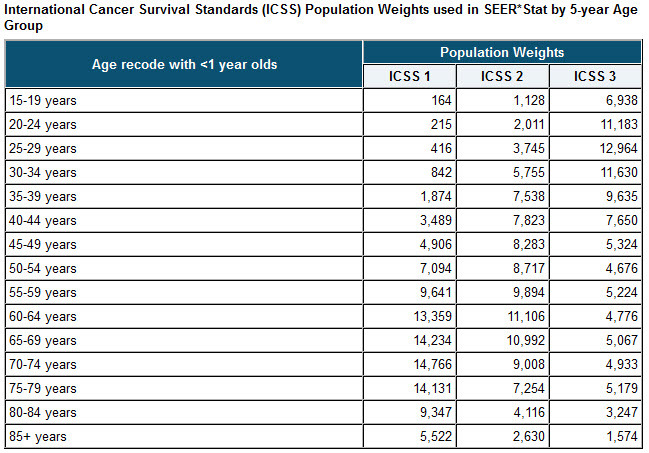 The population weights for the five broad age groups are the sum of the weights for the corresponding age groups in the SEER*Stat age recode variable with weights for ages under 15 being zero. The SEER*Stat 5-year standards vary slightly from the 5year age standards provided in the Corazziari paper. We included one more digit in the standards, so when summed , the 5-year standards would match the standards for the larger groups 15-44, 45-54, 55-64, 65-74, 75+.